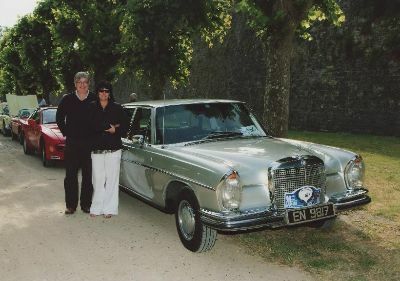 We have been enthusiastic Mercedes owners and drivers for the last 25 or so years, and have covered huge distances in these beautiful and capable cars. We are keen members of the Mercedes-Benz Club, and regular attendees at club events. We have made many like-minded friends as a result. Over the years we have built up a wealth of experience of the marque (though we are always learning new things), and have developed a network of reliable and trusted contacts and suppliers for every aspect of running these cars. Having acquired a small collection of Mercedes for our own pleasure, we found we were increasingly being asked to advise on and procure good examples of these models for friends, friends of friends and acquaintances. From there it was only a small step to formalising the business as Cheshire Classic Benz Ltd.
We like to think we practice what we preach, and our own collection of Mercedes cars currently ranges from 1965 to 1995. The longer we own a car the more we tend to like it, and our longest owned car was purchased in 1997 at two years old. We like to keep all our cars “on the button” and ready to go, and except during the depths of winter they are all used as daily drivers for UK and continental journeys of any distance, though the 1960s and 70s cars are used more sparingly. We don’t have a “modern” tucked away for longer journeys mainly because we don’t like them, but also because the ruinous depreciation on recent models means they are not a cost-effective ownership proposition. From what was originally expected to be a part time activity the company quickly grew to become a full time occupation (and then some!). We are constantly scouring the UK and overseas for the best examples of classic Mercedes, and finding caring owners for them in the UK, Ireland, mainland Europe and beyond. We only deal with Mercedes cars of our chosen era (though we will take other makes in part exchange) as we believe that specialisation is the only way to attain the necessary level of knowledge to serve our customers properly. We have a storage facility near Macclesfield, Cheshire, where we keep a selection of cars for sale. You are most welcome to view them by appointment.